In Experiment 1, photospread administrators (PAs, N = 50) showed a target-absent photospread to a confederate eyewitness (CW), who was randomly assigned to identify one photo with either high or low confidence. PAs subsequently administered the same target-absent photospread to participant eyewitnesses (PWs, N = 50), all of whom had viewed a live staged crime 1 week earlier. CWs were rated by the PAs as significantly more confident in the high-confidence condition versus low-confidence condition. More importantly, the confidence of the CW affected the identification decision of the PW. In the low-confidence condition, the photo identified by the CW was identified by the PW significantly more than the other photos; there was no significant difference in photo choice in the high-confidence condition. In spite of the obvious influence exerted in the low-confidence condition, observers were not able to detect bias in the photospread procedures. 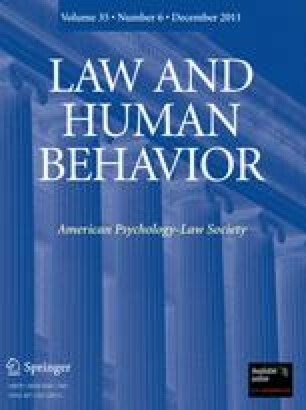 A second experiment was conducted to test a post-hoc explanation for the results of Experiment 1: PAs exerted influence in the low-confidence condition because they perceived the task as more difficult for the eyewitness than in the high-confidence condition. Independent observers (N = 84) rated the difficulty of the confederate's task as higher in the low-confidence condition compared with the high-confidence condition, suggesting that expectations of task difficulty might be driving the effect observed in Experiment 1. Results support recommendations for double-blind photospreads and emphasize that the same investigator should not administer photo lineups to multiple eyewitnesses in an investigation.